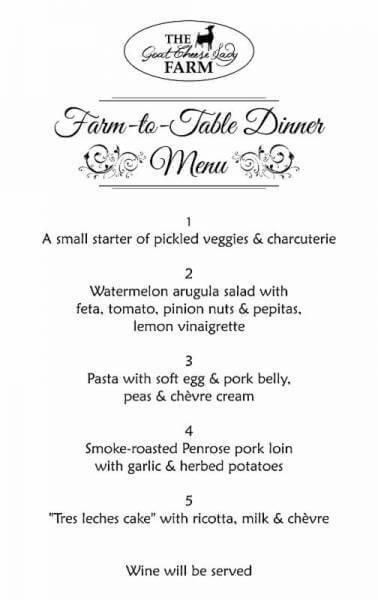 Long-time Ranch Foods Direct favorite Chef Kevin Campbell, just back from a visit with his charcuterie master in France, will prepare a 5-course meal from locally sourced and farm fresh food for this exciting on-farm dinner! During the evening, you will have an opportunity to tour the Goat Cheese Lady Farm, hear about our plans for The Goat Cheese Lady Creamery, see the milk goats and chickens, pet the farm dogs, cuddle the kittens, get nuzzled by the baby goats…and check out their newest addition…two piglets! Julesbee Lifestyle Photography will be snapping photos of the evening! For reservations, call Lindsey, 719-651-9819. Prepayment is required. $100 per person. Saturday, June 18, 5-8 pm Gate opens at 5 p.m. First course served around 5:30. Dinner concludes around 8. Read more about the Goat Cheese Lady and related activities at her website, CLICK HERE.